The RAIL South route will depart directly from the supported hotel in St. Louis and proceed through downtown St. Louis for about a mile and a half, avoiding the St. Louis PrideFest parade, festival area, and 5k race route. The route will then proceed through the park and we will cross the Mississippi River across the Eads Bridge on a sidewalk protected from traffic. After the route crosses the Mississippi river into Illinois, the route will proceed through the suburbs of St. Louis for about 20 miles. While there will be stop lights and stop signs and heavier traffic, we do not expect you to get slowed down too much because it will be so early in the morning on a Saturday and traffic and other things going on will still be very, very light. Once the route goes past the St. Louis suburbs it really opens up and generally follows a mix of highways (new and old US 50 and IL 250) and county back roads to avoid heavier truck traffic while still minimizing mileage. 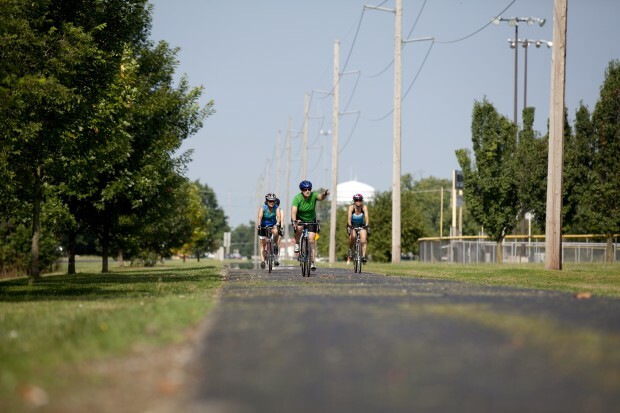 Our route through this part of the state has a long history and as you ride along it you will parallel older alignments of the roads in several places. For example, I-64 was originally supposed to follow the general path of US 50 from St. Louis to Vincennes but the route was modified before all but a short section on both sides of the Indiana-Illinois border was built. This is clearly evident on our route from Lebanon to Carlyle, where new US 50 is effectively an unfinished four lane divided expressway. Overpasses are wide enough to accommodate two more lanes, but that's not the most telling sign. Remarkably, and mind-bogglingly, wherever a bridge was needed, two were built alongside each other. In each case one is used, the other was abandoned and has stood unused for more than 35 years. East of Flora and just after Clay City you will ride past three old abandoned steel truss bridges in a row within two miles which amazingly were open through the mid 1990's. There are also thin traces of the previous iterations of US 50 paved with cement to the north and south of US 50. We will have a supported lunch stop at the Subway restaurant in Olney, only 0.5 miles before rest stop 4. Click Here for more information. Past that it will be clear sailing through the relatively flat, rich farmland and coal country of south central Illinois and you may be surprised to ride past oil fields and pump jacks pumping oil in Illinois directly on the route, especially around Olney and Bridgeport! As the route gets closer to the Indiana border, the topography gets slightly hillier. You will also notice towns with lots of remnants from the turn of the century. Finally, the route will end directly at the supported hotel in Vincennes. Click on one of the links at left for additional information about the RAIL South route.